Generally speaking, there are three types of XenServer storage repositories (SRs) you can use with QuantaStor. The custom LVM disk layout makes it so that you cannot easily migrate the VM to a physical machine or other hypervisors like Hyper-V & VMWare. Potential for spindle contention problems which reduces performance when the system is under high load. Within QuantaStor manager you only see a single volume so you cannot setup custom snapshot schedules per VM and cannot roll-back a single VM from snapshot. 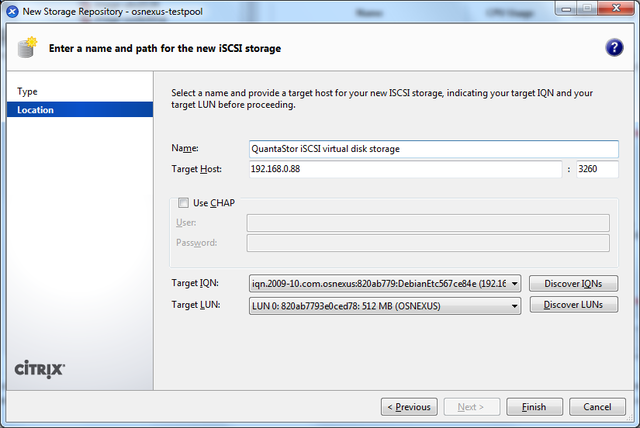 The second and most preferred route is to create your VMs using a Citrix StorageLink SR. With StorageLink there is a one-to-one mapping of a QuantaStor storage volume to each virtual disk (VDI) seen by each XenServer virtual machine. Requires a Windows host or VM to run StorageLink on. Some additional licensing costs to run Citrix Essentials depending on your configuration. With the next version of Citrix StorageLink we'll be directly integrated so it will be just as easy to get going using the StorageLink SR if not easier as it will do all the array side configuration for you automatically. Now that we've discussed the pros/cons, let's get down to creating a new SR. We'll start with the traditional "one big LUN" iSCSI Software SR. The name is perhaps a little misleading, but it's called a 'Software' SR because Citrix is trying to make clear that the iSCSI software initiator is utilized to connect to your storage hardware. Here's a summary of the steps you'll need to take within the QuantaStor Manager web interface before you create the SR. Create a storage volume that is large enough to fit all the VMs you're going to create. Note: If you use a large thin-provisioned volume that will give you the greatest flexibility. Note: You'll want to identify each XenServer host by it's IQN. See the troubleshooting section for a picture of XenCenter showing a server's initiator IQN. Alternatively you can assign the storage to each host individually but you'll save a lot of time by assigning it to a host group and it makes it easier to create more SRs down the road. After you have the storage volume created and assigned to your XenServer hosts, you can now create the SR. This picture shows the iSCSI Software SR type selected. This screen captures the main page of the wizard. Enter the IP address of the QuantaStor storage system and then press the Discover Targets and Discover LUNs button to find the available devices. Once selected, press OK to complete the mapping. Since the virtual machines on the XenServer will be using the iSCSI SR for their boot device, it is important to change the timeout intervals so that the iSCSI layer has several chances to try to re-establish a session and so that commands are not quickly requeued to the SCSI layer. This is especially important in environments with potential for high latency. Per the README from open-iSCSI, we recommend the following settings in the iscsid.conf file for a XenServer. Using the wget command the file can be downloaded directly from your Xen Server. We suggest you save a copy of your original file. The following notes on StorageLink support only apply to XenServer version 6.x. Starting with version 2.7 QuantaStor now has an adapter to work with the StorageLink features that have been integrated with XenServer. After the file is unpacked, cd into the directory. NOTE: These steps must be done for all of the Xenserver hosts that are in the pool. The installer also comes with a file named qstorutil.py. This file can be executed with specific command line arguments to discover volumes, create storage repositories, and introduce preexisting volumes. 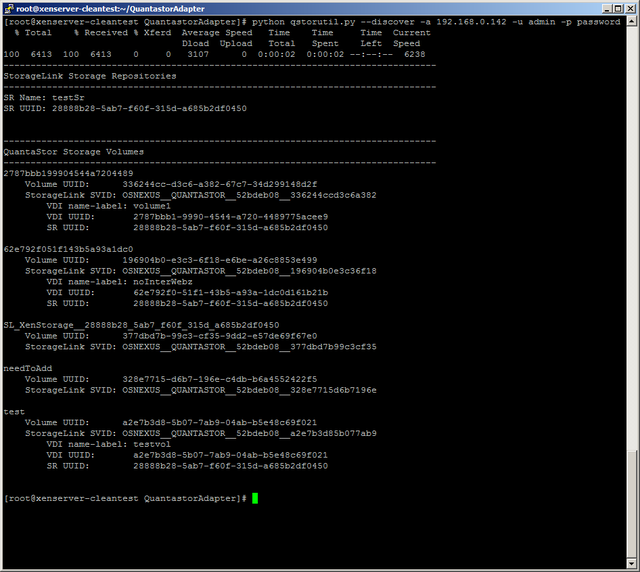 The file is also copied to “/usr/bin/qstorutil.py” during the installation of the QuantaStor adapter for easier access. While the script is the easiest way to create storage repositories or introduce volumes, the adapter will work just fine using the xe commands. We provide the qstorutil.py to make the configuration simpler due to the large number of somewhat complex arguments required by xe. Both of these commands will create a storage repository. One takes the QuantaStor spid where as the other takes the QuantaStor storage pool name (and uses it to figure out the spid). When you create a storage repository, a small metadata volume is created. The metadata volume name with have the prefix “SL_XenStorage__” and then a guid. Storage volume discovery will show you a list of all the volumes on the QuantaStor box specified (via ip address). The list will specify the name of the volume, the QuantaStor id of the volume, the StorageLink id of the volume, the storage system name, and the storage system id. If the volume is in a storage repository on the local XenServer system it will also have three additional fields. These fields are the VDI name, the VDI uuid, and the storage repository uuid. In addition to listing all of the volumes, the discover command will also print out the storage repositories on the local XenServer system. The fields listed are the storage repository name, and the storage repository uuid. Each of these commands do the exact same thing, they just require slightly different parameters. Use whichever command works best for you. The reason for running the discover command before introducing a volume is that the volume vol_uuid, svid, and sr_uuid are all provided in the discover.